“For SERS replacement flats that have met the requisite period, the flat owners may sell them in the open market. For the case you (netizens) cited, the seller had already met the seven-year MOP, and hence was eligible to sell his flat in the open market,” noted the spokesman. 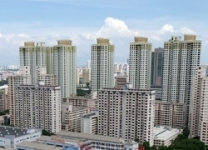 HDB’s website showed that the median resale price for a five-room unit in Toa Payoh in Q4 2011 was S$645,000. The owner had expected to sell the unit at over S$900,000 but eventually settled for S$894,000, said Shawn Guan, the ERA agent who represented the seller.